2016-17 has been another positive year for Ontario Basketball (OBA). The success of the organization could not be attainable without the tireless efforts from our professional staff. Without their commitment, the highlights of this report and the programs and services provided by OBA would not be possible. This past year was another strong year for the organization. Ontario Basketball continues to strive for excellence in finance management following the major deficit reported in 2013 through fiscally responsible financial practices. Despite challenges with the implementation of a new online registration platform, our finance team worked tirelessly and all fees for programs and services were captured. The excess of revenues over expenses reported puts Ontario Basketball into a healthy position with cash flow and provides an opportunity to replenish our contingency account. With confirmed financial support through the Ministry of Tourism, Culture and Sport (MTCS) following a successful Ontario Amateur Sport Fund (OASF) grant application over the next two years, OBA will continue to be aggressive in applying for available grants and securing diversified revenue through sponsorship. Earlier this year, it was sad to see the departures of Spencer Gibson (Coordinator, Marketing and Social Media) and Bess Lennox (Manager, Community Development). It was the first time in several years that a full-time staff member left the organization but we are delighted that both stayed in sport by accepting incredible opportunities with MLSE. Additionally, in an effort to showcase our commitment to providing quality programs and services at all levels, this year saw the addition of Bruce Covert (Manager, Officiating Development), Devin Gray (Manager, Marketing and Communications), Emerson Molina (Coordinator, Membership Services) and Marlon Piedrahita (Coordinator, Community Development). On December 28, 2016, following an immense amount of work in complying with the Sport Recognition Policy instituted by MTCS, Ontario Basketball received “full recognition” as the Provincial Sport Organization for basketball in Ontario. With full recognition, OBA became eligible to apply to MTCS funding programs, including core funding (i.e., OASF). Subsequently, OBA successfully applied for the highest OASF amount eligible and will receive more core funding per year over the next two years than in the previous eight years. Ontario Cup, Ontario Basketball’s pinnacle year-end event for its member clubs, saw another increase in participating teams—from 1,133 in 2015 and 1,141 in 2016 to 1,164 in 2017. We would like to highlight the OBA staff and member club hosts for the tireless efforts in coordinating one the largest team basketball tournaments across the globe. Additionally, considering the continued rise in cost for gym space and game officials, effective September 1, 2017, OBA increased the Ontario Cup registration fee for the first time since 2014. Following a milestone year with the official launch of Ontario Basketball League in 2015, the total number of registered teams increased in year two—from 484 in 2015-16 to 567 in 2016-17. Additionally, as the organization continues to evolve and invest in the league, Ontario Basketball introduced OBLX, the top division defining excellence in the league’s competition model. Lastly, the OBL All-Star Game Showcase has gained traction and become an annual event that will bring together OBL athletes to highlight the top talent in the league. The provincial team continued Ontario’s tradition of success each summer with all four teams making a podium appearance in 2017. The U15 Boys and Girls captured the gold medal at the 2017 Canada Basketball National Championships, in Regina, Saskatchewan, while the U17 Boys won gold and the U17 Girls captured the silver medal at the 2017 Canada Summer Games in Winnipeg, Manitoba. We are beyond proud of the accomplishments of the athletes and coaches who continue to represent Ontario at the national stage. Following the launch of OSBA in the summer of 2015, the league has gained incredible momentum and support from within the basketball community. The increased focus on marketing and communications has helped to elevate the visibility not only within Ontario, but across North America. The season culminated with the OSBA Men’s and Women’s championship at Humber College on April 12, 2017. For the women’s finals, Lincoln Prep defeated TRC Academy, while Orangeville Prep beat TRC Academy in the men’s finals. Moving into the 2017-18 season, we invite the basketball community to visit www.ontariosba.ca to see the schedule for the 12 male and 10 female programs and attend games in-person or livestream highlighted games each week at www.ontariosba.ca/osbatv. Recognizing that game officials are governed by Ontario Association of Basketball Officials (OABO), Ontario Basketball has not been directly involved in developing a key stakeholder in our sport for several decades. This past year marked a milestone for OBA as it established a memorandum of understanding with OABO for a strategic two-year partnership with the goal to collaboratively provide leadership through the development of amateur basketball in Ontario. Among the highlights this past year are the creation of a staff role (Manager, Officiating Development) and a focus on successfully applying for government grants to develop, train and recruit game officials. Ontario was once again proudly represented on the men’s and women’s national teams this past year. Among the many highlights, Canada won its first gold medal at a FIBA international competition by winning the 2017 U19 FIBA Men’s World Cup on July 9 in Egypt. The Ontario influence in this historic tournament run was clearly evident as the entire starting line-up for the final game was comprised of Ontario athletes (eight of 12 in total). 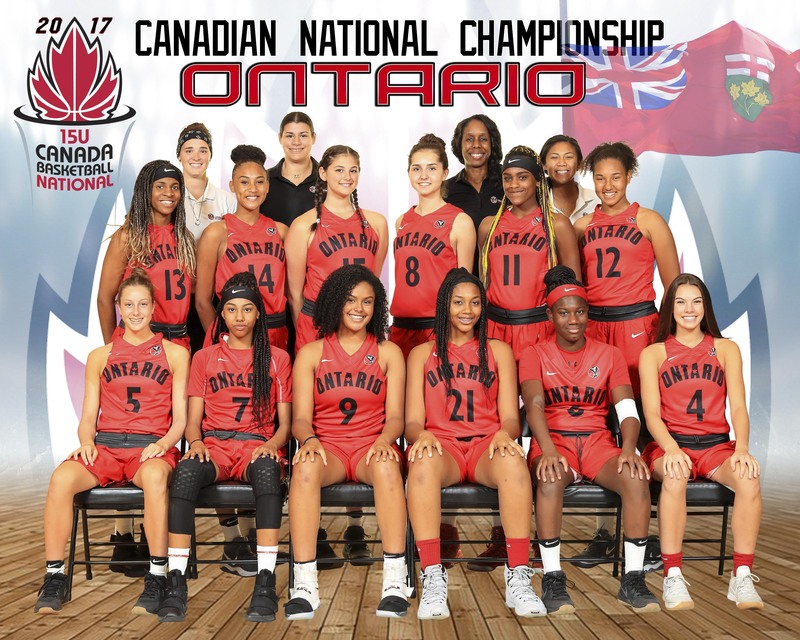 Additionally, with seven of 12 athletes from Ontario, the women captured third at the FIBA U19 Women’s Basketball World Cup on July 30 in Italy. Canada is becoming a force on the international stage and Ontario is proud to be well represented. On behalf of the Board of Directors and staff, we would like to thank the Ontario Basketball membership and all stakeholders for their tireless support of and commitment to amateur basketball across the province. We are thrilled about the ongoing success of the sport and organization and are excited to continue to strive for excellence as guided by our “OBA 2020 Vision” Strategic Plan. Fiscal responsibility and growth continued to be a driving factor at the forefront of all processes at Ontario Basketball for Fiscal ’17. With a previous year of financial growth through the addition of the Ontario Basketball League (OBL), we sought to have a similar year and continued to push ourselves and our programming. Not being content with our previous successes, Ontario Basketball made strides to run self-sustainable programs and maintain and build new partnerships with corporate sponsors (e.g., MLSE, On Spot & Entripy) while continuing to apply for suitable government funding that corresponds with our mission, vision and values. Our financial position at year end reflects that we have come a long way financially in the past several years. We wanted to do better and we have; OBL has grown by 15% in its second year, and we added five OBLX age divisions. Community programming received a 10K RBC Learn to Play grant, increased participation numbers in the Steve Nash Youth Basketball program that we promote in partnership with Canada Basketball, and added the JR NBA Rookie Division program in partnership with NBA Canada. The High Performance and Development team had a successful second Ontario Scholastic Basketball Association season, added a Manager of Officiating Development to their team and continued to manage and grow the Coaching Development portfolio. These are just a few areas that can be highlighted, but there are many more that are reflected in the other sections of the annual report. We are striving to make our presence known by having a bigger social imprint and impact and by being out in the community. The financial strategy was and will continue to be: work harder, work smarter and decrease costs where possible while continuing to improve internal processes, services and communication. Ontario Basketball had another great year for revenue growth from a 3.4 million to a 3.8 million dollar organization. Total revenue for Fiscal ‘17 increased by approximately 13% from the previous year. Expenditures saw an increase of 19%. This increase can be attributed in part to meeting our human resource needs related to increases in programming demands, investment in marketing and media relations and providing material resources to our community partners. Net income or excess of revenues over expenditures at year end is $187,606 compared to last year’s ending balance of $323,400 and an ending net asset position of $976,042. Ontario Basketball is at a point where we have improved our financial position so that we not only meet our obligations, but have cash for reinvestment in areas such as staffing, programming, community objectives and future endeavors. Fiscal responsibility will continue to be a strategic priority for Ontario Basketball for Fiscal ‘18. We will continue to review our core operations to ensure that they are self-sustainable and not reliant on various programs or grant funding to offset costs. Our hope is to have continued growth to allow us to better facilitate and add value to our programming and continue to build on our community commitments. The financial statements of Ontario Basketball have been audited by MacNeill Edmundson Professional Corporation and found to present fairly, in all material respects, the financial position of the organization and the results of its operations and cash flows for the fiscal year ending August 31, 2017 in accordance with Canadian accounting standards for not-for-profit organizations. Review the 2016-17 Audited Financial Statements (.pdf). In the second year since its inception, the Ontario Basketball League (OBL) continues to provide an inclusive, province-wide league structure that allows all participating teams to receive meaningful competition for both genders and all age categories from U10 to U19. OBL participation numbers increased from 484 teams in the first year to 570 teams for the second season. With over 3,500 scheduled games, 6,000 participating athletes, 1,400 certified coaches, 35 OBL official hosts and 2 OBL All-Star Showcases to end the season, our expectations going into season three continue to grow as we work to provide the best competition structure possible. This season also saw the implementation of 5 OBLX divisions from U14 to U19 Boys and Girls. The OBLX seasons were capped off by the OBLX championship weekends, which saw teams battling for the #1 seed at the provincial championships in a single elimination playoff format. With a great deal of positive feedback, we look to expand upon the season’s great OBLX success. One of the top priorities moving into the 2016-17 season was to ensure that teams had a one-stop shop for all things OBL. The OBL website delivered on this promise as it housed all OBL registered teams, schedules, results, registration, photos, videos, content from the All-Star Showcase, and Frequently Asked Questions. In addition to the creation of the OBL website, the registration process was updated to create the most competitive divisions possible for participating teams. This, coupled with earlier schedule releases, added to the overall success and appeal of the OBL. Looking to continue the success of the OBL, we are pleased to announce that this season will have an added focus on marketing and social media. With the introduction of photo contests as well as Athlete of the Week recipients plus sharing weekly photos and videos, athletes and coaches will enjoy these added features through the OBL section of the Ontario Basketball website and social media channels (Twitter, Instagram, Facebook, and YouTube). Teams will also have the opportunity to compete for their respective Pool Championships, and the winners of each pool will receive medals at the end of the season as yet another added benefit. The 2017-18 OBLX season will expand to include the U13 Bantam age category, and teams participating at U16 OBLX will have an increased level of exposure and value added to their respective divisions as we look to continue to provide the best product available to our membership. We thank everyone who has participated for their support in creating this all-inclusive provincial-wide league. Each year Ontario Basketball organizes and stages the Ontario Cup Provincial Championships, which are open to all member clubs. Teams entered into Ontario Cup are made up of club “rep” teams. Ontario Cup offers a competitive playing environment for every skill level by hosting numerous divisions, with division one being the highest level of competition. Participation numbers at the 2017 Ontario Cup Provincial Championships continued to increase with a total of 745 boys’ teams and 478 girls’ teams competing in Ontario Basketball’s culminating year-end event. The consistently increasing participation numbers demonstrate that the Ontario Cup is the height of competition for amateur basketball in the province, which is attributed to not only the quality of the tournament but also the quality of the competition. The high level of competition is a direct result of the commitment and dedication of member clubs, coaches, athletes, parents and staff to continue to grow the game of basketball in Ontario. Aligning the competition structure with Canadian Sport for Life (CS4L) principles continues to be the number one priority of Ontario Basketball’s Clubs & Competitions department. With the current competition structure, the U10 Novice, U11 Atom and U12 Major Atom age groups continue to experience issues related to compliance with Ontario Basketball’s CS4L-aligned Young Player Rules. That being said, the 2017 Ontario Cup received fewer protests than previous years. Ontario Basketball will continue to work on parent, coach and club education to fill any gaps that exist for stakeholders to better understand Ontario Basketball’s rules and the rationale for those rules based on the Long-Term Athlete Development (LTAD) model. While it is important to provide a strong competition structure, it is essential that safety is at the forefront of Ontario Cup. Fair play will continue to be another major focus of Ontario Basketball. Ontario Basketball would like to thank Ranking Chairs Elsa Donovan and Chris Barron for their support of the ranking and seeding process. Their roles continue to be an essential component in accurately ranking and seeding Ontario Basketball teams, which ensures teams compete in the appropriate divisions at the Ontario Cup. Ontario Basketball also thanks all the coaches who helped during the final ranking meetings. The process would not have been possible without their help. In the 2017-18 season, the ranking and seeding process will reintroduce publishing monthly computerized rankings in an attempt to increase transparency. The 2017 Ontario Cup saw the introduction of a new merchandise strategy, which included customizable Ontario Cup t-shirts sold on-site at various locations as well as online on the OBA i.d. Store. The on-site customizable t-shirts were incredibly popular with players, coaches and parents, and many locations sold out. The availability of online merchandise allowed participants to purchase Ontario Cup gear in advance of their respective championship and also ensured that individuals attending Ontario Cup for the older age groups had equal access to the merchandise thus avoiding the insufficient stock situations seen in previous years. Customizable 2017 Ontario Cup merchandise, along with other Ontario Basketball gear, is still available on the OBA i.d. Store. OBA members can use promo code ENTRIPYSHOPS10 for 10% off their first order. Ontario Basketball will continue to introduce new items to keep members excited about OBA merchandise. Additionally, volunteers continue to be the lifeblood of each tournament. Ontario Basketball cannot thank them enough as Ontario Cup would not be possible without them. The passion and energy that they bring has allowed athletes, coaches, parents and OBA staff to have a positive and exciting Ontario Cup experience. The planning and preparation has already begun for the 2018 Ontario Cup. Ontario Basketball will continue to work with each host club to provide an improved Ontario Cup experience. Members can look forward to the integration of other Ontario Basketball programs and events into Ontario Cup weekends, creating a festival-like atmosphere in each of the host cities. These additions will include Mega Hoops sessions, skill competitions and talent identification for players, coaching clinics, and officiating recruitment and development. During each basketball season, Ontario Basketball sanctions over 400 tournaments hosted by affiliated member clubs. The purpose of tournaments being sanctioned by Ontario Basketball is to ensure that the tournament hosts agree to and abide by all of Ontario Basketball’s rules, policies and practices so that all participating teams experience a standard that meets Ontario Basketball guidelines. Ontario Basketball’s community portfolio continues to grow: in 2016-17, OBA ran, facilitated and supported programming for nearly 10,000 youth across Ontario. Using physical literacy-based curriculum, OBA delivered Mega Hoops programming through schools and at special events. Through promotion, program delivery, gear and monetary donations, we have supported various organizations and programming that is affecting change in the communities where it is needed most. Mega Hoops is Ontario Basketball’s flagship community program designed to teach fundamental movement and basic basketball skills while developing physical literacy in young athletes. The program is two-fold: Mega Hoops provides curriculum to teachers at the Active Start, FUNdamentals and Learn to Train stages and allows schools to request that OBA clinicians deliver programming through gym classes. Mega Hoops Mania Clinics are also lead at special events. In 2016-17, Ontario Basketball delivered Mega Hoops programming to over 6,000 youth in schools and at special events across the province. This means that fun, smiles, fundamental movement skills and (hopefully) a genuine love for the game have been imparted to thousands of youth across the province. OBA was the recipient of a 2016 RBC Learn to Play grant and worked with the Toronto Catholic District School Board (TCDSB) to run programming at 12 TCDSB schools in traditionally underserved areas (formerly Neighbourhood Improvement Areas). The grant allowed for teacher training in the National Coaching Certification Program (NCCP) FUNdamentals course, basketball materials for the schools, and OBA clinician instruction in gym classes. In 2018, Ontario Basketball looks to continue to push the momentum of the program and visit up to 25 locations across the province, exposing over 6,500 youth to Mega Hoops. Hoops & Spikes is a collaborative program between Ontario Basketball and the Ontario Volleyball Association that was launched in Spring 2016 with the generous support of the Ontario Ministry of Tourism, Culture and Sport. The 12-week program is designed for children ages 6 to 9 and teaches fundamental movement and sports skills through games and experimentation. Hoops & Spikes is a turnkey program, providing hosts with the full curriculum, participant materials, and coach training required to deliver the programming. The program provides participants with the competence and confidence to be active for life not only in basketball and volleyball, but in a variety of activities. 25 locations across the province have been running this program in their communities. Additionally, Ontario Basketball enhanced the curriculum for community leaders delivering the program by creating videos that were integrated in an interactive PDF that outlines the full curriculum and lesson plans. While the grant period is over, OBA will continue to support the program by providing interested municipalities and organizations with the full curriculum, participant materials, and coach training required to deliver the programming. Further, the program will expand to become Hoops, Spikes & Kicks through a partnership with Ontario Soccer Association. Steve Nash Youth Basketball (SNYB) is a national youth basketball program designed to develop fundamental skills, sportsmanship, and a love of the game in young athletes ages 8 to 12. SNYB is a turnkey program, providing hosts with the full curriculum, participant materials, and coach training required to deliver the programming. The curriculum is updated regularly and provides a wealth of resources for coaches and parents. In 2016-17, SNYB programming benefited over 3,500 participants across the province, a significant increase from last year. Through SNYB, OBA also provided trained more than 300 coaches in the National Coaching Certification Program (NCCP) FUNdamentals course. In 2018, OBA will continue to work closely with Canada Basketball to provide a streamlined registration process for organizations hosting the program. Jr. NBA Rookie Division is a national youth basketball program for children ages 5 to 7 that encourages a fun, active and healthy learning environment. The 12-week curriculum complies with Sport 4 Life’s Long Term Athlete Development Model (LTAD) and is aligned with Canada Basketball’s Development Pathway. Jr. NBA Rookie Division is a turnkey program, providing hosts with the full curriculum, participant materials, and coach training required to deliver the programming. Not only do participants learn the fundamental skills of basketball through fun, engaging games, they are also taught essential life skills including leadership, sportsmanship, teamwork, and respect. In 2016-17, OBA worked closely with NBA Canada to promote and facilitate registration for Jr. NBA. The program grew to over 60 locations in the province. As the program continues to spread across the province, the goal is to reach 75 clubs for this season. Additionally, there has been an increased focus on how to make the program more accessible. 3×3 (pronounced 3-on-3) is a basketball discipline that involves 3 players per team and uses one basket. 3×3 is the most developmentally appropriate form of basketball for young players learning the game. Fewer players on the court means that there is more space for players to move and more opportunities for players to handle the ball. Additionally, athletes control substitutions and timeouts, which decreases their reliance on coaches and increases the opportunity to develop their decision-making skills. There is an international focus on 3×3 development to help promote basketball globally, supported by the 2017 announcement that 3×3 will be a discipline at the 2020 Olympics. In 2017, the first annual OBA 3×3 Basketball House League Festival was organized to promote 3×3 at the grassroots level. Participation was open to all OBA affiliated and non-affiliated teams at the U9, U10, U11 and U12 age groups. There was a provincial tournament that served as a culminating event for winners from five regional qualifiers. The aim of the 3×3 House League Festival is to give young athletes the opportunity to play and enjoy 3×3 basketball in a fun, supportive environment. It also allows participants to practice and improve their skills. A total of 83 teams participated in the regional qualifiers and 26 teams at the provincials. Ontario Basketball will continue to push the momentum of 3×3 and promote and grow the sport through this successful initiative. In June 2017, McMaster University hosted the Ontario regional qualifier for 3×3 Canada Quest, part of Canada Basketball’s national qualifying series for the FIBA 3×3 Men’s World Tour. Team Hamilton, defending champions from the 2016 3×3 Canada Quest East Finals, and Team Toronto earned spots at the 3×3 Canada Quest Finals in Edmonton in July. Ultimately, Teams from Montreal, Saskatoon and Winnipeg represented Canada at the 3×3 World Tour Qualifier, hosted in Saskatoon in July. and many other events and programs run by schools, community centres, and community groups! Ontario Basketball’s annual Career Symposium for High School Girls is a free one-day event at Mattamy Athletic Centre at Ryerson University in Toronto, which took place on November 19, 2016. The event introduces high school girls to the multitude of ways that they can be involved in basketball beyond being an athlete. Through presentations and interactions with accomplished and influential women in the sport, they learn how they can turn their passion for basketball into a career. The speakers represent a broad range of careers, including coaching, refereeing, athletic therapy, sport nutrition, administration, communications, and more. Ryerson’s School of Media provides participants with a tour of the Sportsnet RTA Production Centre in the Mattamy to introduce the girls to careers in sport broadcasting. At the end of the event, participants attend a Ryerson women’s basketball game coached by guest speaker, Carly Clarke, and refereed by an all-female officiating crew, including guest speaker Anna Del Col.
Ontario Basketball gratefully acknowledges the support of the Ryerson Women’s Basketball Program in putting on this free event. 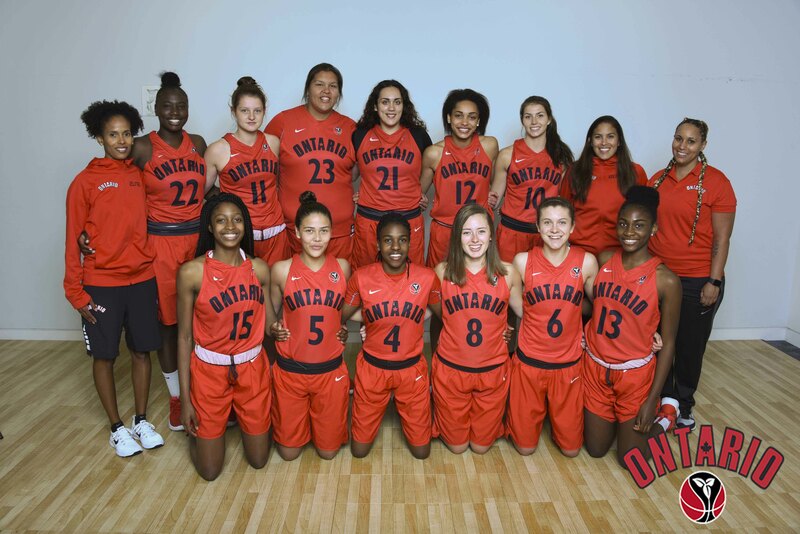 Ontario Summer Development Program (OSDP) is the latest iteration of Ontario Basketball’s Talent Identification and Development Program (TIDP). As the landscape of basketball in Ontario changes, so too does our programming – and the rebranding of TIDP to OSDP was a reflection of this new landscape. The rebrand was less about programming or structural changes and more about effectively communicating the nature of the programming that we had to offer. OSDP give the opportunity to develop the WHOLE person (with camp being a true growth opportunity). Talent is no longer the only outcome or objective – it is more about the DEVELOPMENT of our athletes. After the Ontario Basketball season, U12 and U14 athletes participate in regional training sessions followed by a centralized overnight camp. In 2017, well over 750 athletes participated in OSDP regional training. At regional training, coaches delivered programming that built fundamental movement and basketball skills, increasing the athletes’ confidence. Regional training was followed by a centralized camp, which featured a number of special guests who worked with and spoke to the athletes about a variety of subjects from the importance of setting goals to how to take care of your body to individual training to what being a leader means. For each age group, a total of 200 athletes attended the centralized camp at the Athlete Institute and feedback from coaches and parents was overwhelmingly positive. The success of the program can be attributed to the involvement of our dedicated coaches and Ontario Basketball’s commitment to making continued improvements to the program. Parents and coaches provided feedback through surveys and Ontario Basketball is exploring new partnerships to make OSDP more relevant and enjoyable for all participants. This upcoming year also marks a return for our U14 athletes to the Ontario Summer Games, which will be in London. This four-day tournament is an excellent opportunity for the athletes to consolidate the skills they learned in training in a competition setting. Centre for Performance (CP) is a national program designed to develop athletes to compete at the international basketball level. The program revolves around the “hot house” approach and focuses on athletes in the key years of their development. The emphasis of CP is to train skills that athletes do not otherwise have the opportunity to develop. CP is not based on a competition model. Instead, it is a group of athletes training together in regional pods across Ontario with the common goal of improving. Regional training pods are led by high-level, certified coaches who follow age-specific curriculum developed by Ontario Basketball and Canada Basketball. Top athletes are selected to attend centralized training sessions. CP has been restructured to ensure continued identification for provincial and national level athletes and to increase synergy with Canada Basketball programming such as Targeted Athlete Strategy (TAS), Jr. Academy and Age-Group National Teams. Led by the technical leadership of Agnes Borg (girls) and Jason Dawkins (boys), in 2016-17, the girls’ program offered eight regional pods while the boys’ side offered nine. Combined, over 200 student-athletes participated in regional pods, which is an increase from the previous year. Team Ontario represents the pinnacle for high performance athletes and coaching development in Ontario. 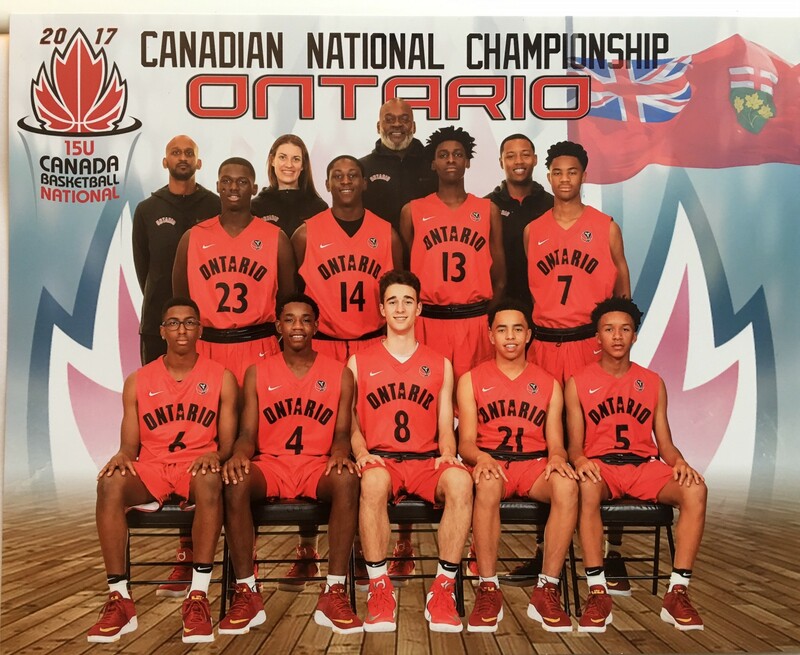 With double gold at the 2017 U15 Canada Basketball National Championships and a gold and silver for the U17 teams at the Canada Summer Games, Ontario kept the tradition of competing at the highest level intact. This summer, over 70 athletes and 17 coaches participated in the provincial team program. 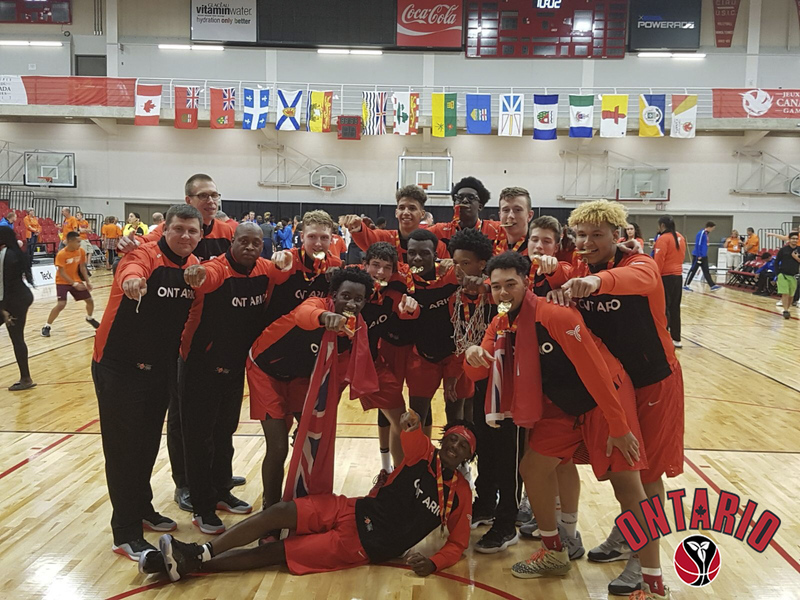 After a close win against Quebec during the round robin at the Canada Basketball National Championships, the U15 team took home gold in dominating fashion in the finals with a 75-55 win over Quebec. Merissah Russell led the scoreboard with 20 points, while Aaliyah Edwards followed with 17 points overall. Edwards also showed off her strong game collecting 10 rebounds, 1 assist, 2 steals and 1 block, and her efforts were recognized with tournament MVP honors. Merissah Russell and Callie Wright were named First Team All-Stars, and Ciante Downs was selected as a Second Team All-Star. The team attended the SLAM Camp Summer Tournament in Quebec and the Nike National Invitational in Chicago prior to the championships. Fabienne Blizzard served as head coach for the second year alongside returning staff Lexie Sananes and Michelle Abella. The U15 Boys defeated Quebec 88-71 in the finals of the Canada Basketball National Championships. The Ontario athletes put in an incredible effort with Caleb Houstan leading the way with 21 points. Jonathan Avgousti followed behind with 15 and Charles Bediako rounded out the top scorers with 12. Houstan and Bediako also cleaned up the boards bringing in 11 and 9 rebounds, respectively. All three athletes received awards; Avgousti earned tournament MVP honors while Bediako and Houstan were selected as First Team All-Stars. Tyler Delevante was also named Second Team All-Star. Head coach Fred Grannum worked with assistant coaches Mike Selliah and Marla Gladstone and apprentice coach Steve Bettencourt. At the Canada Summer Games, the U17 Girls fell short in the gold medal game, falling 70-57 to Quebec. Julia Chadwick led the way with 13 points, shot an impressive 85% field goal average, and added 5 rebounds and 3 assists. Christina Morra was just shy of a double-double performance putting up 8 points and 10 rebounds. Prior to the Games, the team attended the U.S. Junior Nationals in Cincinnati and the Nike National Invitational in Chicago. Veteran Team Ontario head coach Christa Eniojukan was supported by assistant coaches Jessica Roque, Kendal Ross, and Lee Anna Osei. Ontario had a difficult path to the finals at the Canada Summer Games with their two closest games coming in the quarter and semifinals. The team managed to emerge victorious against New Brunswick and Quebec by a margin of 6 points. In the finals, however, they made their presence felt early and came home with a gold medal after a 108-65 win over Alberta. The boys shared the wealth during the final with every player scoring and five players in double figures. Jaden Bediako led the way with 20 points and 8 rebounds. Joel Brown, Emmanual Miller, Connor Vreeken and Ben Hendriks added 15, 14, 13 and 12 points, respectively. In his second year coaching the U17 Boys, head coach Jason Dawkins led the team alongside his staff comprised of Brock Bourgase, Jamie Campbell, and Marlon Greene. The focus for the provincial team program moving forward will be to create a sustainable and fiscally responsible program, while providing an optimal training and development environment for coaches and athletes. The goal of the Ontario High Performance Sport Initiative (OHPSI) to identify, develop, and support Ontario athletes best capable of achieving future international podium success on senior national teams in targeted summer and winter Olympic/Paralympic Games and Pan/Parapan American Games sports. OHPSI funding supports targeted female basketball players through the provision of specialized services and individualized training and support. Increasing the number and quality of Ontario athletes on the age-group national teams (five of 12 U16/U17 Cadette athletes and seven of 12 U18/U19 Junior athletes) while supporting Canada Basketball’s high performance goal of developing athletes who meet stage-appropriate Gold Medal Standards with ultimate goal of future international podium success of the senior national team. The national-level purpose of TAS for Canada Basketball is to identify, develop and support nationally targeted athletes toward meeting Gold Medal Standards and providing world class technical and basketball specific integrated support team leadership and education to Provincial Basketball Associations and targeted women’s basketball coaches. With support from the Canadian Sport Institute Ontario (CSIO), Ontario Basketball and Canada Basketball work collaboratively to coordinate and implement various talent selection, identification and high performance athlete development programs in Ontario with the goal of achieving International sporting excellence. The second OSBA season concluded April 12, 2017 with two exciting games for the Women’s and Men’s Finals at Humber College in Toronto. The inaugural Women’s Final matched third seed TRC Academy against fourth-seeded Lincoln Prep with both teams coming off upset semifinal victories against top competition. While TRC had a slight edge with a higher seed and the W for their previous game against Lincoln, Lincoln Prep defeated TRC Academy 71-54 to be crowned as the first OSBA Women’s Champions. Read the OSBA Women’s Final recap. The Men’s Final saw the top two seeded teams face off in a closely contested championship match. Top-seeded Orangeville Prep and number two seed TRC Academy both finished the regular season with 18-2 records and the only thing separating them was a mere point differential. The result was a thrilling game with Orangeville Prep coming out on top, 99-97, to win the OSBA Men’s Championship. Read the OSBA Men’s Final recap. OSBA is proud to announce the award winners for the 2016-17 season, as voted by the coaches. The OSBA continues to grow; the 2017-18 season has three new women’s programs and one new men’s team. The men’s league is also structured into two divisions. Keep up to date with the Ontario Scholastic Basketball Association by visiting www.ontariosba.ca and following @OntarioSBA on Twitter, Instagram and Facebook. Ontario Basketball has continued to deliver the National Coaching Certification Program (NCCP) clinics throughout Ontario. Ontario Basketball is continuing to work with our Coach Developers (Learning Facilitators/Evaluators) on ways to strengthen coaching in Ontario. We are looking to develop current Coacher Developers and also looking to engage experienced coaches into Coach Developer roles. A Coach Developer refresher is being planned for the 2017-18 season. Ontario Basketball will be a partner for Canada Basketball’s NCCP Super Clinic taking place in conjunction with the 2018 FIBA U18 Americas Championship in the Niagara region. A multitude of NCCP contexts and trainings will be delivered. Quest for Gold (Q4G) provides education-based subsidies for competitive to high performance coaches, including those at the club, high school, and university level. Q4G is also instrumental in delivering financial assistance to Provincial Sport Organizations (PSOs) for coach training-related costs. Q4G aims to ensure that Ontario’s developmental and high performance athletes receive the best coaching possible by providing a series of enhancement programs and resources for coaches and PSOs. The Q4G Coach Bursary, which is offered through the Coaches Association of Ontario, has been a major support to the training and certification of coaches in Ontario. In September 2016, Ontario Basketball hired Bruce Covert as Manager of Officiating Development to lead a variety of initiatives related to officiating development across the province. Covert has officiated and developed officials at the community, provincial, national and international levels for over 40 years and he has held numerous leadership roles with Ontario Association of Basketball Officials (OABO) and International Association of Approved Basketball Officials (IAABO). Covert’s officiating expertise in combination with his extensive network with the officiating community have greatly enhanced OBA’s basketball development efforts in the province. Ontario Basketball established a memorandum of understanding with OABO for a strategic two-year partnership with the goal to collaboratively provide leadership through the development of amateur basketball in Ontario. OABO members will benefit from access to Ontario Basketball’s officiating development initiatives funded through Ministry grants. Ontario Basketball received funding from the Ministry of Tourism, Culture and Sport that allowed Ontario Basketball to host two officiating development initiatives in conjunction with OABO. Through generous support from the 2016-17 Ontario Sport and Recreation Communities Fund, Ontario Basketball launched the Ref ON Female Officiating Mentorship Program to provide 28 novice female officials with officiating training, development, and mentorship. The participants attended an All-Female Officiating Development Camp in December 2016 where they were matched with 10 high-level female officials who served as mentors. The mentors led off-court sessions for the participants and observed them refereeing Ontario Basketball League games and led post-game evaluations. After the Camp, Manager of Officiating Development Bruce Covert worked with local officiating board assignors to facilitate game assignments with program participants and their mentors so that they could referee together. Mentors also attended games refereed by their mentees to evaluate and provide feedback to them. The program culminated at the end of the 2016-17 season with the free Female Officiating Symposium on April 29 and 30, 2017. Over the two days, participants took part in off-court sessions led by program mentors. On the first day, participants attended the OUA Women’s Basketball All-Star Game and observed six of the program’s mentors referee the game. Afterwards, program participants, mentors, and the OUA All-Star players congregated for a social. Through the 2016 Team Ontario Development Grant Program, Ontario Basketball hosted the Canada Summer Games Officiating Development and Selection Camp in March 2017 to determine Ontario’s nominees for the 2017 Canada Summer Games. The camp also served as a professional development opportunity for the officials and featured three esteemed guest speakers: Tom Lopes and Donnie Eppley from the International Association of Approved Basketball Officials (IAABO) and Nancy Ethier, a former FIBA-carded official. The speakers each led a professional development session and assisted in evaluating the officials. Provincial evaluators from OABO and Ontario University Athletics (OUA) were also brought in from across the province to assist with evaluations. In February 2017, Ontario Basketball hired Devin Gray in the new Manager of Marketing & Communications role. Gray brings marketing and communications experience at OFSAA and Canada Basketball. He has also worked as a basketball writer and media influencer with Yahoo! Canada Sports, North Pole Hoops, NBLC Canada and various other basketball outlets covering the game at all levels from high school to the NBA. Ontario Basketball has greatly benefited from Gray’s marketing and communications expertise. Ontario Basketball partnered with Holland Bloorview Kids Rehabilitation Hospital’s Concussion Centre to develop head injury awareness and strategy across all its programs. The safety awareness programs began with a series of four concussion education sessions presented at the Ontario Summer Development Program camp for boys and girls ages 12 and 14. Youth participants learned signs and symptoms of concussion, steps to concussion management, and return-to-play health guidelines developed by the Holland Bloorview Concussion Centre. In collaboration with Holland Bloorview, Ontario Basketball will develop and execute a formal concussion strategy involving concussion stakeholder education, training, policy development, awareness campaigns, and services. Equipped with the knowledge our players will gain through this partnership, we believe they will be in a better position to assess their own injuries as well as take a leadership role on their team when teammates suspect concussion. Atleta – the LinkedIn for basketball players in Canada. Supporting with publicity and receiving a reimbursement for those who sign up using OBA promo code. On Spot – custom on-site clothing screening who also managed sales at many of our Ontario Cups and eased the burden on OBA staff managing and selling merchandise. Rep-That – stickers and decals for OBA member teams with reimbursement to Ontario Basketball as well as providing stickers to OBL All-Stars. Support the rapidly growing game by recruiting, developing and training new referees. In an effort to engage with young potential officials, Ontario Basketball composed and distributed a video and campaign tagged #GRABAWHISTLE. Through OBA’s distribution channels, the campaign generated a total reach of 27,000 and led to many direct inquiries to Bruce Covert, Manager of Officiating Development. This summer Ontario Basketball partnered with Gatorade to provide roughly $1,800 of product to the four Team Ontario teams (U15 and U17 Boys and Girls) travelling to Canada Basketball National Championships in Regina and Canada Summer Games in Winnipeg. In return for the VIK product, Ontario Basketball completed a social campaign over Twitter and Instagram where the Gatorade logo and #FuelledByG were incorporated into player bios, interview videos, and a website post. Take a peek at OBA’s Gatorade #FueledByG campaign. This extended campaign demonstrated the reach of OBA’s social media channels by generating a total of 193,000 impressions, 12,000 engagements, and 5,700 video views. As part of Spalding’s expanding line of product, they unveiled a series of high performance aids including shot stick, blocking pad, dribbling goggles and more. To introduce them to Ontario Basketball’s membership, we received an exclusive sneak peek at all the gear available for use following OBL All-Star Games at HoopDome. Players were given a chance to test out the gear and announcements were made throughout the event to support their upcoming release. Learn more about Spalding’s training aids. Each of Team Ontario’s four teams (U15 and U17 Boys and Girls) and OSBA’s 22 teams received the full Media Day treatment including headshot portraits, full-body action shots for select athletes, and interviews. The equipment used and post-editing led to better media available for promotions of our teams and increased the perception of professionalism of OBA.